What: If Narnia existed in New York City this would be it. As you take the elevator up to Serra Alpina just close your eyes, and imagine you’re walking through a wardrobe to this magical winter wonderland. What: If you’re looking for a perfect holiday Instagram post, Donner and Blitzen’s Reindeer Lounge won’t disappoint. Fire places. Cocktails. Elf Nog. It’s holiday delight everywhere. What: If you crave cheese on a cold day, Murray’s Cheese Bar is here for you. Grilled cheese? Check. Fondue? Check. Raclette? Check. A cheese plate? Check! Yes, they have it all, and it’s marvelous. What: Ophelia’s Lounge is on the 26th floor of the iconic art deco tower which originally served as a women’s only club. Apparently it was also one of Frank Sinatra’s favorite haunts. This winter it’s dripping in snowflakes. Sounds like a swanky night out to me. What: If you don’t want to fight the crowds at Rockefeller Center, the South Street Seaport puts up a beautiful tree for all those holiday pictures. Afterward, you can get brunch at Industry Kitchen with water views, and candy cane cocktails. Did I just plan your Sunday? You’re welcome. 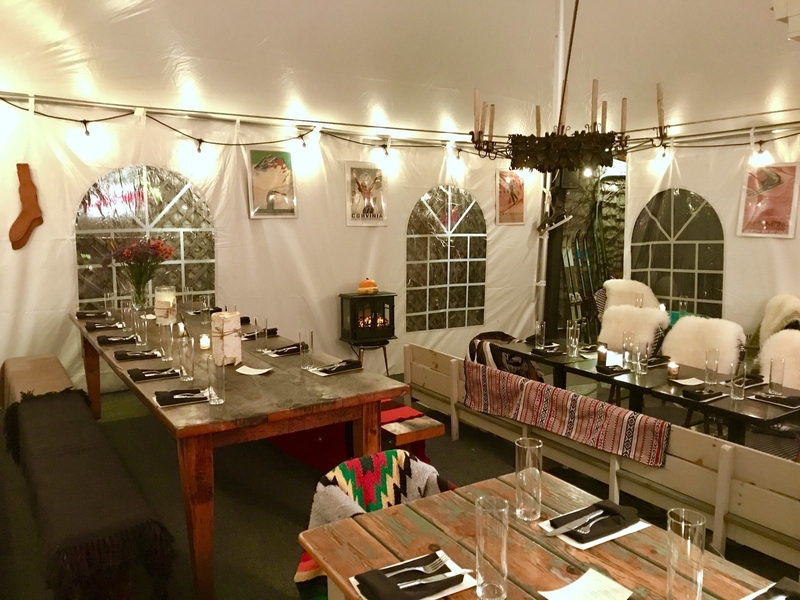 What: If your apartment is too small to throw a holiday party, why not throw one in a yurt? Also does this picture make you feel like you’re in Game of Thrones or is that just me? What: Jealous of Santa’s cookie plate on Christmas Eve? Me too. Head over to Gramercy Tavern for cookies, milk, and all the holiday decor. Ho Ho Ho. What: If Beauty and the Beast was one of your favorite Disney movies this is a library Belle would be pretty pumped about. Get whisked away in a good book (don’t worry if you didn’t bring one, they have plenty.) Order a glass of wine or whiskey and pass the day in cozy festive comfort. What: If you’re a bit bummed it’s winter already and can’t make it to the southern hemisphere for summer Christmas, Sippin’ Santa is the cure. Beach-themed Santa cocktails will ease you into the holiday spirit. What: If you’re braving it to see the tree at Rockefeller center, why not brave it over to Times Square to have cocktails at this heated rooftop chalet in the Sanctuary Hotel? 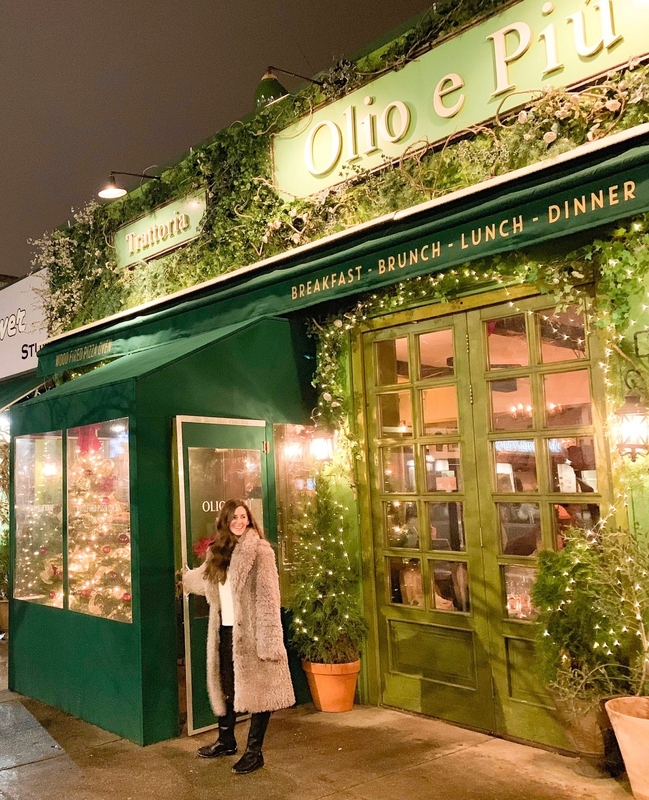 What: This cozy Upper East Side favorite gets all decked out for the holidays and we love it! Also the chances of running into any tourists are pretty slim. A good place to enjoy some holiday cheer as a local. What: No holiday restaurant list is complete without Rolf’s. Luckily you can enjoy all this holiday flare ’til May! Trust me, Rolf’s might just be the joyful escape you need in February when you haven’t left your apartment in days. What: Rosemary’s grows vegetables on its rooftop and in their Hudson Valley farm. They’re dedicated to fresh seasonal food. It’s wonderful. They’re also dedicated to making you feel all warm and fuzzy this winter because their holiday decor is full of cheer. What: Tiny’s and the Bar Upstairs is, well… tiny, and in a little pink house with a fireplace, and decorations. You’ll probably want to move in, or at the very least curl up, and stay a while. What: Walk through the kitchen of Café Select to the back room where the holiday cocktails and fondue are served. You can order all the same stuff in the dining room. But you’ll feel like you’ve discovered a New York secret when you get to the back chalet, and who doesn’t love that feeling? What: The Winter Garden Chalet is perfect for a festive celebration with people you love, or people you don’t. At least you’ll have a furry blanket on your lap, and can pretend you’re in the Swiss Alps. I mean, that’s a win no matter who you’re sitting next to.